Mad Teddy's website: ...Can the new millenium really begin, finally? ...Can the new millenium really begin, finally? Australia is a dry country at the best of times - but especially so over the last several years, during which we've been suffering a prolonged drought. So when we do get a bit of rain, it's a noteworthy event. Exactly three weeks ago (12th Feb.), towards early evening, a big dark grey cloud appeared and moved eastward toward Mount Barrow, covering most of the sky. Before long, there was indeed a very welcome splash of rain, with enough sunlight getting through a break in the cloud to give rise to an impressive rainbow. There was even a quite clearly visible secondary rainbow - what a treat! 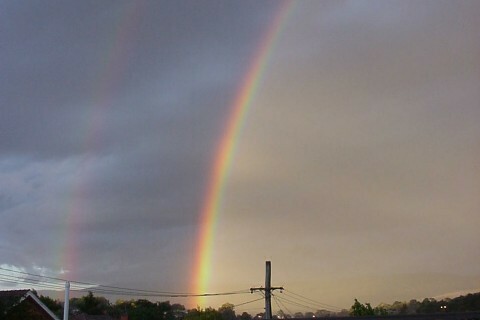 Perhaps the most dramatic aspect of rainbows like the one pictured above is how they divide the sky into two distinct regions - light (inside the rainbow) and dark (outside). The physics of rainbows is quite interesting. If you'd like to read more, I recommend this web-page which presents it rather well. A hundred and one days ago, Australia voted for a new beginning. On Saturday, 24th November 2007, the Aussie people went to the polls and threw the Howard Federal Government out. It's been a long wait. After eleven and a half dreary, stifling, frustrating years, at long last our country has a chance to rejoin the civilized world. From where I'm standing, it's an enormous relief. During those eleven years, a whole crop of young people have grown into their teens or even early adulthood, never having had the experience of any other kind of government - so that they may well think that what has been happening is in some way normal - whereas we oldies, who remember years of vision, creative drive, and life actually being exciting (even fun, at least some of the time!) have been alarmed to see how our country has begun to lose its very soul. Now, perhaps, the damage can begin to be repaired, while there is still that pool of first-hand experience available so that we don't have to completely "re-invent the wheel", as it were. I, and members of my family, were proud to do our bit to help bring about a change of government. 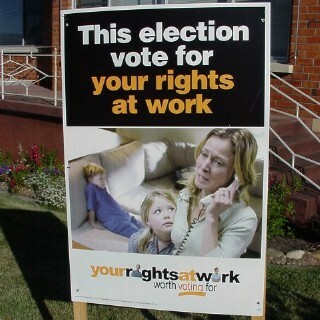 A union representative from my wife's workplace asked if we would mind if they put up a "your rights at work" poster on our front lawn - which was OK with us! Here's a photo I took of it. Of course, it unashamedly plays on the working person's fears of losing his or her job. But that's fine - the Howard government had introduced the euphemistically-entitled (even Newspeak is an appropriate term here!) "Work Choices" legislation which made it easier for employers to sack workers, who had previously been protected under "unfair dismissal" laws - which meant, bluntly, that it was now legal to fire someone unfairly! Why am I doing this, since we've only just had a federal election here in Oz about six months ago (with a Labor government returned, albeit by the skin of its teeth) with another election not due for two and a half years? Simply because, as long as there is anything like the "profit first, people last" brand of politics we endured from our country's government between 1996 and late 2007, this could very easily happen again. So I'm doing whatever I can, without apology, to keep the issue alive, for as long as necessary - which almost certainly means for as long as this website continues to exist. This time, there was a mood abroad like nothing that had been seen in years. Immediately prior to every election since Howard became Prime Minister (1996), he and his party machine have managed to pull some kind of rabbit out of the hat. We've had "weapons of mass destruction", "children overboard", and the "Tampa crisis" - all designed to wedge the Labor opposition and scare the public into re-electing the Liberal/National Party government. Indeed, in 2007, the government had concocted an issue about a certain Indian doctor working in Australia, trying - unsuccessfully - to link him to a group of terrorists in England. The government's very public failure to pull this stunt off elicited considerable scorn around the country. By late 2007, the public had had enough of their nonsense, and there was a grim determination to get rid of them at long last. One of the most intriguing aspects of the whole campaign was the decision by high-profile ABC journalist Maxine McKew to stand for the ALP in John Howard's own seat of Bennelong. The effect of this was to keep Mr. Howard pinned down in his own electorate, fighting to hang on to his own seat rather than running around the country and orchestrating his party's campaign far and wide. I'll be honest: during the later stages of the election campaign, when the opinion polls consistently showed the Howard government in serious trouble, it occurred to me that they might manufacture a "terrorist threat" or something similar, to use as an excuse to declare a state of emergency and thus postpone the election indefinitely. (Paranoid? Moi?? Well, after over a decade of BS, half-truths, and outright lies, I wouldn't have put anything past them!) But, fortunately, my fears were unfounded - we hadn't yet quite sunk to that depth. At 6:00 p.m. on election day, when the polls closed, I removed the sign from our front lawn; and we settled down to watch ABC-TV's coverage of the day's events. It didn't take very long before the result was clear: the government had taken a hiding, and the ALP's Kevin Rudd was to be our new Prime Minister. But the best part of the story for me was Maxine McKew's sweet victory in Bennelong, finally consigning John Howard's nightmare vision of Australia to political history! Early in the week after the election, I had occasion to be in Launceston's city centre. Now, it may be my imagination; but I felt I could sense a distinct mood change. In the streets and shops, it seemed as though people and organizations had slowed down just a bit, and were drawing their collective breath. I could visualize a huge thought-balloon hovering over the town, containing the words "AT LAST..."
As promised, the new government got down to business straight away. New Prime Minister Kevin Rudd announced that there wouldn't be much of a Christmas break for himself and his team; there was much to do in a hurry: ratifying the Kyoto protocol on climate change (which the Howard government had stubbornly and consistently refused to do); issuing an official, federal parliamentary apology to Australia's indiginous people for the stolen generations (ditto); and beginning the process of dismantling the previous government's so-called "Work Choices" legislation. In the last few days, the new government has also begun to address the issue of immigration. This had become a running sore under the previous administration, with refugees (always referred to as "asylum seekers", to mask the horrors many of these people had faced on their way here) being kept for years in dehumanizing conditions in "detention centres", which many Australians have come to regard as nothing more than concentration camps - not to mention the ignominy of some Australian citizens also being "mistakenly" locked up in these ghastly places for extended periods. Maybe I'm a simpleton, but I can't fathom how such "mistakes" can possibly occur in this era of intensive record-keeping and near-instantaneous communications. I just don't believe a word of it! Australia is supposed to be a civilized, modern, "first-world" country! How could we possibly have sunk so low? How did we become so desensitized that we came to accept the truly degrading as normal, and the horrendous as commonplace, for so long? Anyway - we have finally elected a government which has begun to deal with such matters, and have thus given ourselves some kind of "permission" to move on. I really hope I never again in my lifetime see anything like what has been perpetrated in the name of the Australian people, these past several years. Surely, as a nation we can do better than that?! Furthermore, the Rudd Labor government has promised to address the issues of health (the services for which have been allowed to run down in recent years) and education (which is also in urgent need of attention). So, on the face of it, things are looking up! Can we therefore rest assured that our country will forge ahead in these next three years, with dignity and honour for all its citizens? Is everything in the garden really quite as lovely as it seems? Among my quite extensive collection of science fiction books is "The Black Cloud" by English astronomer Fred Hoyle (Penguin, 1960; my copy is a 1975 reprint). It's fun to read. Without giving too much away, it tells - with characteristic British humour - the story of an interstellar cloud of gas which Earthbound astronomers realize is headed towards the Solar System. Its diameter is approximately equal to the radius of Earth's solar orbit, which means that it could conceivably have a major impact on our planet if it happened to get between us and the sun. The scientists inform the government of the impending crisis, and are granted funding to attempt to come up with a solution. Over time, they determine that the cloud has a complex internal structure, and is in fact an intelligent living entity; eventually, they are able to communicate with it. The fun part of the story is that the scientists don't bother to give more than a "bare-bones" account of what is going on to the politicians, who are considerably less than impressed when they find out! It was that same "scientific power dream" which made it possible for "boffins" like Alan Turing and his colleagues at Bletchley Park to construct and use one of the earliest electronic computers to crack the German "Enigma Code", thus hastening the end of World War 2; and also for the Apollo project to succeed with the moon programme a quarter of a century later. Of course, in both those instances, there was careful collaboration between the scientists and engineers on the one hand, and the authorities on the other, which made everything happen as it should. But there have been instances in which the borders are less clear-cut. In recent years, advances in genetic engineering have led to genetically-modified crops, stem cell research, even the possibility of a human clone being produced at some stage - all of which is viewed by many as scary stuff. Should scientists be allowed to pursue a "scientific power dream" unchecked? Can they be relied upon to have humanity's best interests at heart? - or is there at least the potential for greed and hubris to enter into the equation, so that regulation is needed? It's a thorny issue, and I don't intend to pursue it further here. The point I do wish to raise, however, is that there can be "power dreams" other than the scientific - and that the issues arising can be just as thorny, if not even more so. These novels were intended for a young audience (the unfortunate word "juvenile" is often used in this connection). The hero of the stories is a young biophysicist named David ("Lucky") Starr, who is employed by the Council of Science, a powerful organisation which has the ear of the Solar System's main governing bodies. In the first story - which takes place on Mars - Starr's mission is to find out who is behind a world-wide spate of food-poisonings on Earth (which imports much of its food from Mars). While there, he meets and befriends a short, pugnacious Mars-born farm-worker named John Bigman Jones (who insists on being called by his middle name). In the next four stories, Starr and Bigman, under the auspices of the Council of Science, set out to deal with threats to the Solar System posed by "the Sirians", inhabitants of former colony worlds in the Sirius star-system, who have become hostile to Earth and the Solar System. In the sixth and final novel, which opens with the news that the Sirians have invaded the Saturn system and established a beachhead, our two heroes and another Council member head for Saturn - with the Council's unofficial blessing, and very much on their own - on a secret mission which, it is hoped, will avert an interstellar war. The reason for mentioning them here is that, in the future they depict (the 22nd Century), it's not the economists who have the main "ear of government" so much as the scientists, as represented by the Council of Science! Something deep down inside me finds itself singing, along with "My Fair Lady"'s Eliza Doolittle: "Wouldn't it be loverly...?" Toward the end of 1983, there was a federal election in Australia. At the time, there was a Liberal/National Party government headed by Prime Minister Malcolm Fraser; the Labor opposition was led by Bob Hawke. I voted Labor (just as I did on 24th November last year), specifically because I wanted to get the dam stopped - which did indeed happen. However, in the following months and years, I began to grow uneasy about the direction the Hawke government was taking on other matters. Four years earlier, in 1979, Margaret Thatcher had become Britain's first female Prime Minister. Then, in 1981, Ronald Reagan became the President of the United States of America. Between them, they revolutionized the economic climates of their respective countries. (Reagan's version became known as "Reaganomics".) The right-wing ideologies of the two leaders were virtually indistinguishable in most major respects. Surely, this sort of thing couldn't happen in Australia, could it...? However - to the consternation of many, myself included - when Bob Hawke's government was elected in 1983, some of the changes it initiated were very un-Labor-like indeed; click here to read a brief history of the period. One change not specifically mentioned in that page is the deregulation of the banks beginning under Hawke (click here for a bit more background, on that issue in particular). The Treasurer in Hawke's government was one Paul Keating. Click here to read how Keating eventually challenged for the leadership and knocked Hawke off his perch, becoming Australia's Prime Minister in 1991. I, for one, was confused and disillusioned. How could the "working people's party" be doing this to the Australian people? What could a disenfranchised electorate do? Where could we go? For the record: I didn't vote for John Howard's Liberal/National Party at the 1996 federal election. (I was angry, but I wasn't stupid.) However, like a lot of other disillusioned Australians, I didn't vote Labor, either. I voted for whom I saw as (possibly) worthy independents at the time. - And so, we got Howard - eleven years of him! From my perspective, all Howard and Co. had to do, in order to impose their particular ideological agenda, was to entrench and exacerbate the very worst that Labor had put in place since 1983 - and that's exactly what they did. There was a federal election at the end of 2004. The Labor leader at the time was Mark Latham, whom many - myself included - saw as a way out of the wilderness for Labor. However, he committed the unpardonable error of losing his temper at the eleventh hour, thus playing right into the hands of the Liberal/National Party government. I was devastated. It was around that time that I determined that I would create this website and thus try, in my own way, to make a difference before the 2007 election. So now here we are, with a new Labor government - at long last. What can we now say about the present and immediate future of our country? So what has that do with Australia - or anywhere else, for that matter? Well, as we are reminded ad nauseum, we live in a global economy, so that's just the way it is - in Australia just as much as anywhere else! - Except that it's clearly not working. This time, it seems, the nut is too tough for even the sledgehammer of monetary policy to crack. Inflation is continuing to rise regardless. The ugly term "stagflation", which was first coined in the mid-1960s and became a buzzword in the 1970s, is back in parlance again. Clearly, something is very, very wrong. I venture to suggest that the Thatcher/Reaganomics which has been so enthusiastically adopted by the developed world is fatally flawed, and we are quite simply going to have to find a better way. Just as the "scientific power dream", satirized by Fred Hoyle in "The Black Cloud", can't be trusted to result in acceptable decisions affecting whole countries, or even the entire world - so what I consider to be the "economic power nightmare" of Thatcher, Reagan et al is not to be trusted for our financial security. Economic globalization is anti-democratic. When I voted for Kevin Rudd's new Labor government in late November last year, my intention was to vote for a team who would represent me as an Australian citizen - not as a mere speck in a world-wide money machine. You can have a global economy, or you can have a democratically-elected government, at the helm of your country's affairs - but you can't have both. They are mutually exclusive. Each country has the right to be an entity in its own right within a community of nations. Nothing - and especially not anything to do with economics! - should be allowed to trample on that right. Let's work toward an economy which benefits Australians, regardless of what may be going on elsewhere in the world - and let other countries adopt a similar approach! By all means, let there be a community of nations willing and able to help each other through tough times - but let's not allow the economic problems of any one of them to undermine the security of any other nation or nations. Let's have an Australian government which has the vision and courage to govern for Australians, and - if necessary - to step on a few offshore toes to do so, come what may. We are definitely living in interesting times. Just three days ago, on Tuesday 4th November, the 2008 US presidential election was held, resulting in an emphatic win for Democrat Senator Barack Obama. It seems that the times really are "a-changing again" (to quote the last line of my own song "The Loan Sharks"), and that dreams really can still come true after all, even in our tired, jaded old world. Just short of a year ago, we Aussies voted for a chance to have a clean start, and retake our place among the community of civilized nations; now, the US has done the same. The collective sigh of relief we experienced "down under" last November is now heard around the entire planet. Now, at last, perhaps we can all work toward the kind of "globalization" we really do need: not the kind where the mighty dollar reigns supreme, or any one nation thinks it can own and control the entire world, but the kind where all right-minded people can begin to work together to tackle the enormous problems we all face - in particular, the horrific environmental and economic threats which have arisen in recent times - and strive to make our world a safe, livable place for everyone.